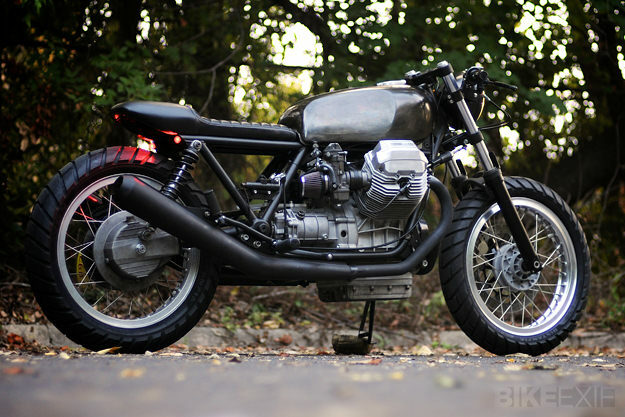 With too much bodywork and an awkward looking 16” front wheel, the Le Mans IV wasn’t exactly the prettiest Moto Guzzi to roll out of Mandello del Lario. 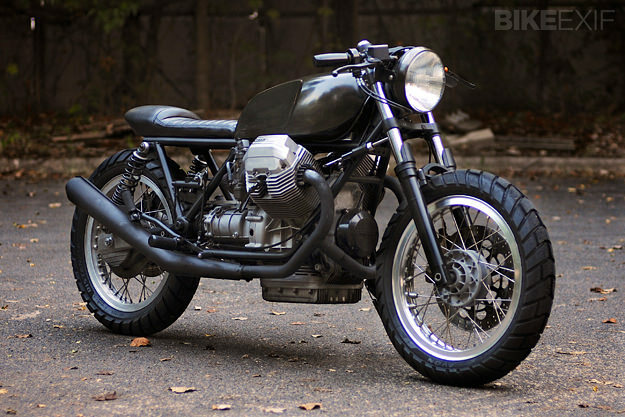 So it’s not surprising that the owner of this 1986 model turned to Texas’ Revival Cycles to transform it from factory stock into the bike you see here—on a budget. 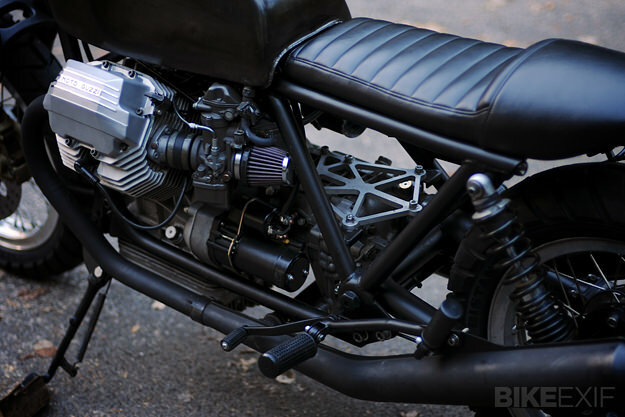 After poking around the shop for a compatible suspension set up, Revival stumbled upon a 2010 Moto Guzzi V7 Classic front end that was a near perfect fit. They laced up a V7 hub to a Borrani style rim and, with some adjustments, managed to graft the V7 triple clamps, forks and brakes onto the Le Mans. The front brake caliper was upgraded to a larger Brembo unit, custom slimline stainless brake lines were installed, and the forks’ spring rate was increased. This Le Mans now looks, handles and brakes far better than it did from the factory. Once all the bodywork had been ditched, Revival Cycles mounted a Yamaha XS fuel tank that they had on the shelf, hollowing out the center to make room for all the electronics. The tank and headlight shell were sanded, and treated by ‘bluing’ them chemically to protect them and give them a unique dark bare metal appearance. The frame was de-tabbed and coated satin black, with tiny LED lights mounted in the rear of the subframe as taillights. A custom vinyl-covered seat was fitted, along with Revival’s own CNC tie-plate, which ties together the frame and gearbox. Being fans and frequent users of Motogadget components, Revival rewired the entire electrical system around the m-Unit—an ingenious all-in-one controller that allows you to greatly simplify a bike’s wiring. 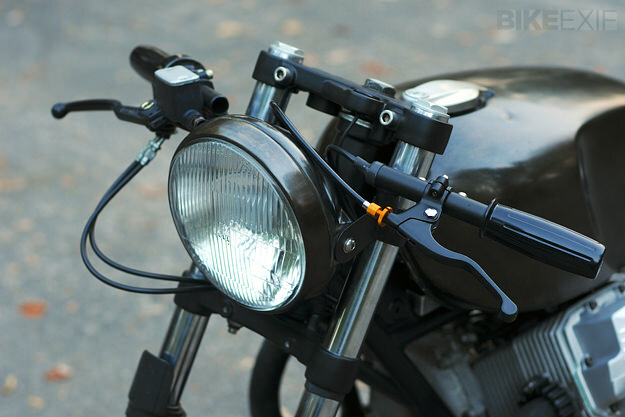 This allowed them to fit tiny push buttons in place of the stock, clunky switchgear, and replace the ignition with Motogadget’s wireless RFID m-Lock. 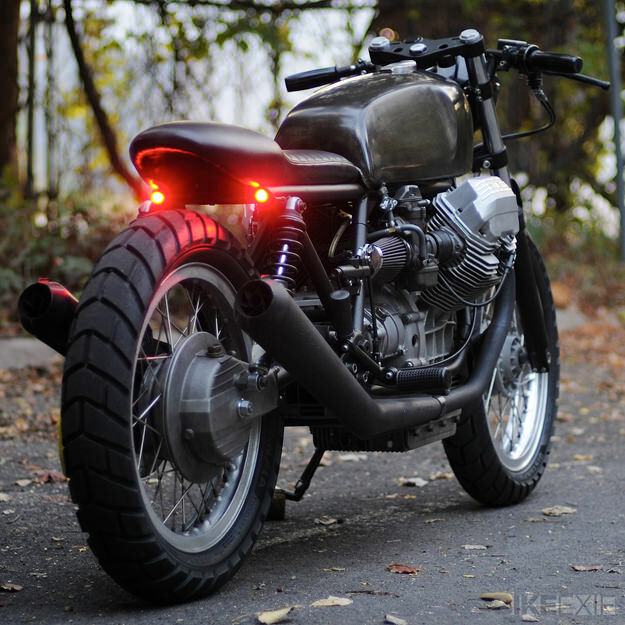 Head over to the Revival Cycles website for more images of this gorgeous build.